Sciatica is a term that gets used quite frequently in the physiotherapy world. This refers to pain, tingling and/or numbness that goes down the back, hip or entire leg. It can happen to both younger and older adults for a variety of reasons. For some, it starts after a traumatic event like a slip and fall or after a motor vehicle accident. It can seem like pain develops out of nowhere for others. Pain can start gradually then suddenly increase in severity. The majority of the time, sciatica is a condition that starts with some mechanical changes in the low back that build up gradually over a period of time. Sciatica can be very debilitating when it is in the acute stage. Pain can be quite sharp and severe. As a result, sciatica can limit your movement and function completely. A lot of patients at this stage will rate their pain intensity at a 9 or 10 out of 10. Any position or movement may be pain producing. Anything you try, including over the counter medication, may not help with the intensity of pain. You may feel very helpless and scared at this stage. The sudden onset of intense pain may make you wonder if there is something seriously wrong. You may even feel that you need to go to the emergency room because the pain is so severe. Should you go to the Hospital for Sciatica? It is not necessary to go to the Hospital for Sciatica. Typically, most people with Sciatica can recover quickly with the help of a trained Registered Physiotherapist! PhysioNow has trained professionals standing ready to help you Now! We do not need a doctors referral to see you at PhysioNow. However, you may require a doctor’s note for your insurance plan to cover your treatment. Our Physiotherapists will screen for any serious issues and send you to a doctor if they find any ‘red flags’ with your Sciatica. We will direct bill to your Extended Health Plan if your plan allows us to do so. However, if you feel more comfortable seeing a doctor first, head to the Hospital or your family doctor. Any of the above-mentioned conditions would require emergency treatment, which the hospital would provide. Thankfully, for most patients, their sciatica is not from anything serious. Most incidences of sciatica are mechanical in nature and can be treated with Physiotherapy. Once the hospital has ruled out anything serious, they will likely prescribe some medication for pain management and provide a referral for physiotherapy. For most people, sciatica can be treated with conservative treatment such as physiotherapy. The important thing about treating sciatica effectively is to determine the correct source of the pain and address those specific areas. 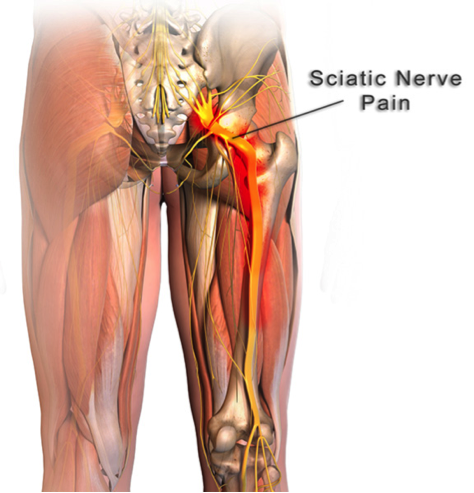 What is causing the Pain from Sciatica? With most sciatica patients, the pain is coming from pressure on one or more of the roots of the sciatic nerve. The pressure on the nerve affects the proper function of the nerve and causes the symptoms to go down the leg. What about if I have Tingling and Numbness? Is that more serious? The tingling, numbness and weakness that a patient may experience is not something that will be permanent in most cases. A good analogy for this process is like when someone is stepping on a water hose. The pressure from the foot stops the water from passing through the hose. However, once that foot comes off the hose, the water will flow through without any issues. Similarly, the symptoms along the leg will get better once the pressure is removed off the nerve. Physiotherapy will help with this! This pressure on the nerve may be caused by an injury to the disc or bony changes in the area. An experienced physiotherapist will be able to perform a thorough assessment that will determine the potential cause of the sciatica. Once the cause of your sciatica is established, the Physiotherapist will be able to provide the most appropriate treatment to take the pressure off the nerve. Lots of research out there has shown that passive treatments such as heat, ice, and electrical modalities, like IFC and ultrasound, do not provide long term solutions. These types of modalities may be useful in the acute phase to help with the management of pain. They can be combined with other treatments as part of the overall treatment plan for sciatica. However, on their own, they are unlikely to make any significant and long-lasting changes. Specific movements are usually the most effective at shutting off your Sciatica Pain! Your Trained Physiotherapist will determine the best movement for you to shut off your Pain! More importantly, there has to be an evaluation of what positions and/or movements are pain producing and which are pain relieving. A physiotherapist who has lots of experience working with low back issues will be able to help make this discovery. Therefore, the results of the movement assessment will allow for the prescription of the appropriate exercise to help take the pressure off the nerve roots. For example, if you feel less leg symptoms when you arch your back backwards, then that means your nerve is less irritated with that movement. As a result, your treatment plan will then include exercises that involve various forms of backwards movements that continue to improve your leg symptoms. What Does Centralization of the Pain mean? As the pressure on the sciatic nerve improves, the pain will move upward towards the low back in a process called centralization. In general, these changes may happen quickly for most patients. However, with more complex cases, it can take longer to ease the pain and regain function. As a result, any movements that produce centralizing symptoms are going to be beneficial in reducing pain. In the majority of cases, pain can be resolved completely, and you can return to your normal level of activities quickly. What do I need to know to keep the pain away? It is important that the physiotherapist provides proper education. They should give you a good home exercise program for the continued maintenance of your sciatica condition. As a result of the pain, some patients will continue to avoid certain activities or movements because of their experience with sciatic pain. Therefore, it is important that your physiotherapist work with you to regain full function and confidence with your mobility. PhysioNow has highly trained Registered Phyiotherapists ready to help you with Sciatica. We have same day emergency appointments available. Call today to help with the Sciatica Pain! 289-724-0448.